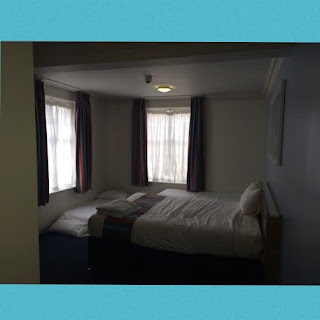 A little while ago we were lucky enough to be invited to stay with a travelodge of our choice to experience their newly refurbished rooms and to have the ''travelodgical'' experience and I have to say that we really were not disappointed. When we arrived at the Travelodge Canterbury Chaucer the first thing that struck me was how pretty the building looked. It really fitted in with old, character buildings around it and it was really refreshing to see that the Travelodge had kept a lot of the character and features from the original building. The other bonus was that they had ample parking and we were given a parking permit which meant we didn't have to pay! When we walked in we were greeted by two very friendly and polite members of staff at reception who explained everything we needed to know. They explained about breakfast, where our room was and said that if we needed anything such as more towels or water then to let them know. I loved that both of the members of staff seemed genuinely happy to help rather than just forced to follow a script as such as it was their jobs. The reception area itself was tidy and clean and it gave a really great first impression. When we arrived at our room I was honestly shocked. It was huge with a wonderful clean smell that hit you as soon as you walked in. The room had a huge, very comfy king size dream bed (which I will talk more about in a moment), 2 single beds and a travel cot. With all of this in, the room still looked big and had loads of room for bubs to crawl around in which was great! Going back to the bed, I am normally very fussy with beds and mattresses. Hubby is the polar opposite. He will sleep where ever his head hits the pillow but I am a lot more particular. This bed was amazing. I didn't get any backache or have a bad neck at all. I was seriously impressed and am now a huge lover of their Dreambeds!! The bathroom was also lovely and was immaculately clean! There was a tub in the bathroom which bubba enjoyed having a bath in and a wonderful shower which me and hubs both enjoyed (not together I hasten to add!!!! Hahaha!!). The other part that I loved about this room was that you could still see the character of the building in the decor. It had beautiful coving and plush carpets which fitted in with the 'historical' feel that the hotel had. The whole room just honestly exceeded my expectations. The size, the cleanliness, the decor, the amenities (had tea and coffee, a kettle and a wardrobe with hangers) were all brilliant! section. The restaurant also had a small corner with chalk boards, books and toys for their younger guests which I thought was a really lovely touch. 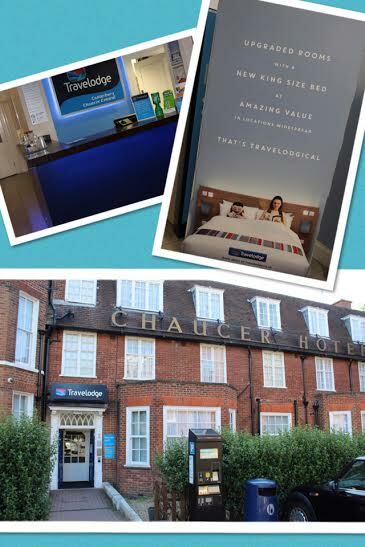 Overall, our stay at the Travelodge Canterbury Chaucher was fantastic. The room, the staff, the facilities all exceeded my expectations. I would not hesitate to stay with them again and would very strongly recommend them be it for a stay with family or a couples night away. 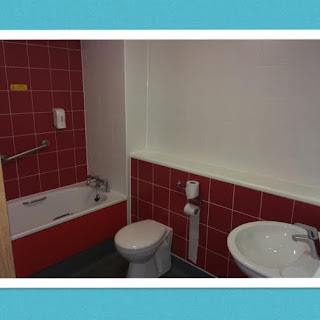 Note: our stay at the Travelodge Canterbury Chaucer was provided to us for review purposes but this has in no way effected my opinion of them. This review is all true and 100% by own thoughts and opinion. The lovely Becky from Cuddle Fairy had tagged me in the Versatile Blogger Award! She only nominated me this morning and I am being super organised by getting this up and done so quickly :) If you haven't already, then check out Becky's blog which is full of great linkys, brilliant helpful blogging posts as well as recipes, travel and family stuff too (she is really a jack of all trades!). 3. Nominate 5 bloggers to do the same. 1. I have a serious 'thing' about Thunder storms. I seriously hate them and have to fight really hard to keep my fears under wraps as I do not want to make Bubba scared of them too. 3. I cannot stand pickle! I hate it more than any other food in the world! 4. Until I was about 16-18 years old I seriously thought that squirrels laid eggs as they lived in trees like birds did. 5. If my house or the room I am in is untidy I find it really hard to relax and chill out. I love nothing more that I tidy, clean house with a couple of candles burning. 6. I was born with Hip Dysplasia and needed an operation when I was a baby to fix it. 7. When I was pregnant with Bubs I suffered with bad morning sickness that latest until I was about 18 weeks gone. It was so back that once I was walking around Tescos and come to the cooked chicken bit and the smell hit me and I vomited all over the supermarket floor!!! (sorry if TMI) It was most probably the single most embarrassing moment of my life! 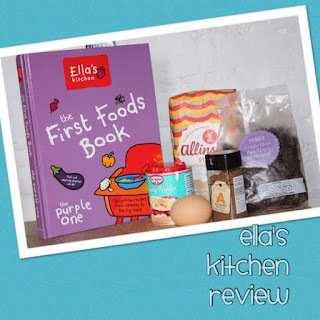 Ella's kitchen The Purple One Book Review! 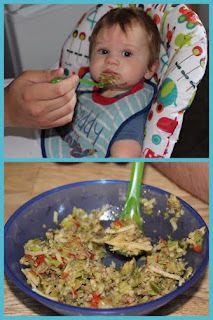 A little while ago you may have seen that we were lucky enough to have tried a couple of the recipes from an Ella's kitchen recipe book (if you haven't seen it then check it out here). About a week ago we had the book sent through itself and I felt the need to blog about it as it is bloody brilliant!! The First Foods Book from Ella's kitchen (the purple one) covers all stages of weaning, from first tastes all the way up to meals for toddlers and yummy finger food for older babies. The first thing that really struck me with the recipes in this book was the fact that all the ingredients needed were ''normal'' things. By that, I mean that the recipes were calling for things that I would have in my cupboards like ground all spice and curry powder rather than some books that I have used which call for things that I wouldn't even be sure where to buy!! The other element of the book that I also really loved was the introduction pages at the start of each stage of weaning which went through things like what foods the baby can start to try, how much on average they should be eating and other useful hints and tips for that stage. This is accompanied by a really helpful weaning chart that you can stick up on your fridge or wall as a quick weaning reference when your cooking. The chart also includes a really nice sections where you can record all of you babies weaning milestones and food preferences. The recipes themselves are gorgeous. There is such a varied mix from basic fruit and veg purees to curries, pies and pastas, just to name a few. It felt to me like the recipes in this book were a lot more up to date than some books I've used recently with flavours and meals that me and Hubby would also very happily eat. So far, I've used two recipes from the book and they have both turned out to be great successes. 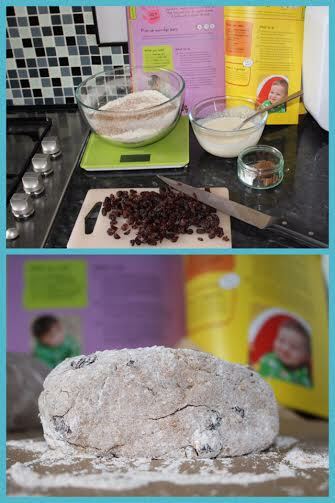 After browsing the finger food sections for some snack ideas for Bubs, I decided on making him some of the 'Really Raisin-y Soda Bread' as he loves fruit bread and I thought this may be a great home made alternative. It was so easy to bake with simple, fool proof instructions and after 30 mins out it came from the oven and onto Bubba's plate (after cooling first obviously!!) and he loved it!!! 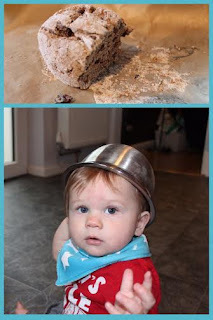 He also enjoyed helping me by wearing mixing bowls on his head!! haha!! I really loved the fact that I knew exactly what had gone into his snack and that there was no junk in there. 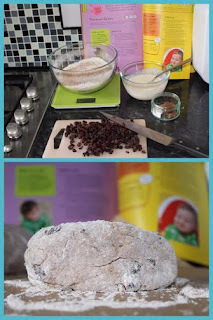 Just good, old fashioned baking stuff and lot's and lot's of raisins. to start getting used new flavours and chunkier food. This dish was a huge success (although his face in the picture says the total opposite) and it was so yummy that even Hubby said he would have eaten it and he is a super fussy eater. I can honestly say that I am excited about cooking so many more dishes from this book and am also really looking forward to cooking and preparing a lot more of the finger foods ideas as snacks for Bubba as he has just enter a new stage of ''snacking'' which is totally new territory to me. The First Foods Book from Ella's Kitchen retails for £14.99 which, in my opinion, is total value for money as this book will last us way into the toddler years. Visit Ella's Kitchen on their website here to see their full range of Cook Books. I was sent this book free of charge for review purposes but rest assured that all opinions on this blog are honest and my own. Now, before I get into this I know that this is going to be controversial. The topic itself is surrounded by controversy every single day but after a recent experience I want to get my thoughts out there. If you don't agree with me then that's fine but we are all adults so there is no need for anyone to get nasty. When I was pregnant I wanted to breast feed. 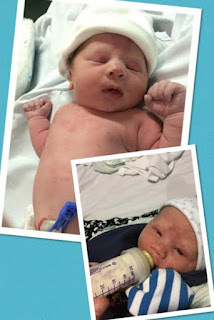 I wasn't desperate to but I wanted to give it a damn good go as I know that 'medically' it is best for your baby and I also wanted to have that bonding breast feeding experience with my newborn BUT I did go and buy some bottles before hand. The reason behind this was because in a perfect world I would have loved nothing more than being able to breastfeed my son exclusively for the first couple of weeks and then after that, express and put it into bottles so that my husband could feed our son and be involved. I was under NO illusion that breastfeeding was going to be easy so I had got it into my head that I was going to try my best but if it didn't happen then it just wasn't meant to be so I wasn't going to beat myself up about it as I know a few Mum's who have been really hard on themselves for not being able to breastfeed. prick blood test done after every feed to check his blood sugar levels. It was honestly the most helpless I have every felt in my entire life. Having to watching my newborn having to have a little tiny canular stuck in his hand and hearing him scream out every time they pricked his heel for blood was the most upsetting thing I had ever experienced. Twice a day they would take him away from me and wheel him down to NICU for his antibiotics and it broke my heart that I wasn't allowed to go with him. Even writing about it now, I can feel tears starting to prickle my eyes. I had just given birth to my glorious little boy and all I wanted to do was go home, snuggle with him and my husband and begin our new chapter as a family. Instead, there were times where Hubby had been sent home because it was out of visiting hours and Bubba had been taken for his antibiotics and I was left feeling empty, alone and helpless. It was honestly the worst time of my life. Now, the reason I have gone into all of that is to give you the background and to hopefully help you understand this next part. When Bubs was born they tried to get him to latch on but it wasn't working. He was getting stressed and screaming as he was hungry/wanted comforting, I was getting stressed and emotional (and literally dripping with sweat) and after about an hour or 2 I said to my husband ''Thats it...just get him a bottle please!''. With that, we never looked back. I'm not sure if it was my fault because I was so tired and emotional during the 4 day hospital stay or if Bubba just couldn't latch on because I'm rather large chested but it just didn't work and we didn't try again. I know why we didn't and that was because during all the drama of the infection and all the test etc the midwives and doctors needed to know how much milk he was taking and by bottle feeding him it meant that we could see exactly what he had taken to then allow the blood sugars to be worked out. 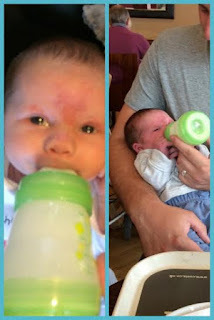 Even once the blood sugar tests stopped, we continued to formula feed and do you know what, to this day I can say that I do not regret our decision one bit! Bubba was a monster when it came to milk and he used to take so so much even in his early days so I can only imagine how tiring and painful it would have been if I would have breast fed. Bubba also developed silent reflux so we were able to manage this quite easily and help him by just simply changing his milk. Formula feeding also meant that Hubby could be involved in the feeding which wasn't only great for me (to selfishly allow me to get a little more sleep) but more importantly allowed the two of them to bond together and for me to have just 10 minutes away rather than having my baby stuck to my boobie 24/7. Call it selfish, call it irresponsible, call me a bad parent..whatever. I really don't care. 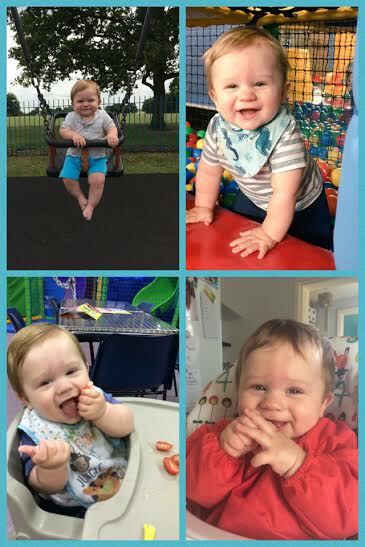 My son is now a very healthy, extremely happy 10 month old little boy who has always been as happy and healthy as his breastfed baby friends. What really gets me though, and actually what prompted this post, is when people become so almost obsessed which being an advocate of breast feeding that they become judgmental, sometimes nasty people. I had a recent run in on Twitter with 2 'Lactavists' (look it up, its an actual thing) who said a few things to me but a fellow mummy blogger of mine was totally slammed by them. The fellow blogger responded to a question I had put out about gifts for soon to be mummies and they suggested a bottle of ready made milk just in case. I thought it was a great idea as you never know if breastfeeding is going to work for you and OH MY GOD...hell broke loose. These 'lactavists' started questioning why we didn't breast feed and saying that we should be supporting new mums not condemning them to formula and then when the other blogger put her side across they started to almost interrogating her asking why she didn't use donor milk or donate her milk. It was unbelievable. This is 2015!! Women have the right to choose how they feed their child and there is NO ONE that should be questioning that...especially not un-medically trained randoms on twitter! It boiled my blood!!! 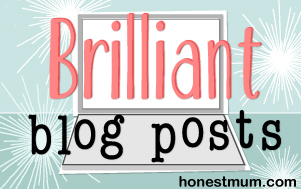 I am now an official Blogger for Emma's Diary as part of their Blogger advocacy programme :) Which basically means that Emma's diary liked the look of my blog and the way I write so have asked me if I will guest post for them. This to me is so unbelievably exciting as I can't quite believe that a brand that is so well known as established like Emma's diary wants to work with little old me!!!!! For those of you that don't know (well you must have been hiding under a rock), Emma's diary is a parenting channel that covers everything from trying to conceive and pregnancy all the way to talking about children of 3 and 4 years old. They have a website (visit them here: www.emmasdiary.com) which you can read all sorts of advice on and also sign up to their forums to allow you to chat with others in similar positions as you and they also have a magazine which you get in your bounty pack when you are pregnant which has vouchers for some fab Emma's diary packs. 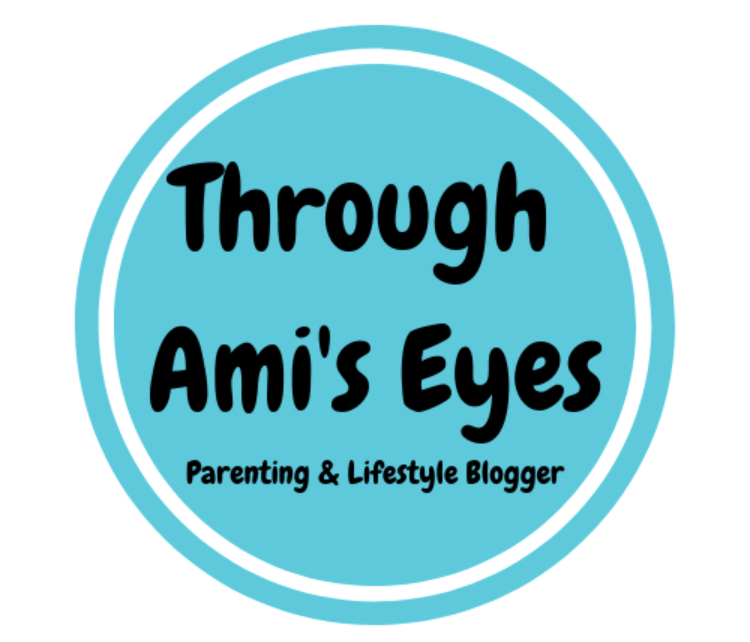 My first post is due to go live on their site on the 19th August and I will OF COURSE be spamming all of my blog and social media sites with links to it as I am really proud to be involved in something like this. We all know that brushing our teeth is important. Leaving the house without brushing your teeth to me would be like leaving the house without clothes on...you just wouldn't do it. So if we are so conscious about brushing our teeth...why are we not encouraging our children more? New stats that I saw yesterday have found that A THIRD of children don't brush their teeth....A THIRD!?!?! That is crazy to me! Bub's is just cutting his first tooth now and I am already looking at what tooth brush to get and how best to brush that little one tooth he will soon have. Why, oh why is there a third of children out there who aren't brushing their teeth!?! This is just a handful of information sites and tools that are available to encourage kids to brush their teeth so I just can;t understand why a third of children still don't do it. More to the point, I can't believe that a third of parent are not doing more to encourage good oral hygiene. Have you got any great tips on how to get kids to brush? 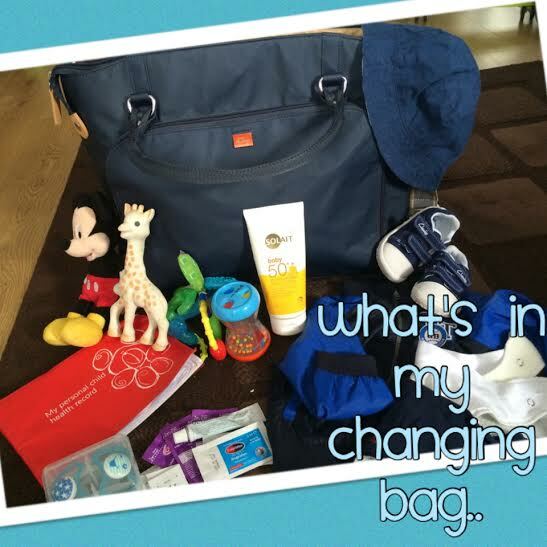 This is a post that has been requested quite a bit in recent months and now it is finally here...what is in my changing bag! NOTE: None of this is a sponsored post and all items that I mention in this post including the bag itself are 100% what we use and what we have brought. So firstly, the bag itself. 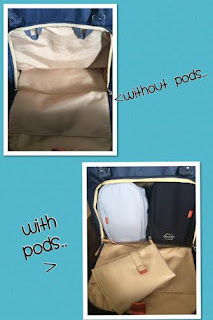 Now, when I was pregnant and looking at buying a changing bag I kept on saying how I didn't want to spend loads of money on it as it is 'only a bag' but then I came across the Pacapod range one day and fell in love. We got the Pacapod Mirano as I thought the colour would suit a baby boy and also wouldn't make hubby feel too silly if he was carrying it. The bag is totally wipe clean and comes with a front pocket (great for your phone) and an internal zip pocket which I tend to keep dummies and medicine in. The best part of this bag though is the pods! The Mirano comes with a feeding pod and a changing pod which both attach inside the bag via a Velcro loop in their own separate compartment. 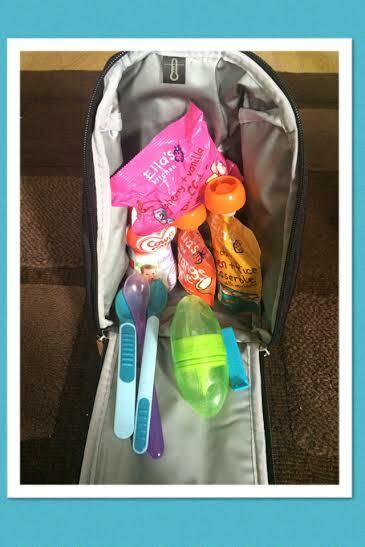 The compartment is so easy to access and unzips all the way around to expose both the pods which is great when you are out and about and need to quickly grab a snack or juice for little one. The pods come out of the bag which is the other element I love. This means that when you baby needs changing you don't have to take the whole bag with you, you can just take the pod. The pods themselves have so many perks as well. 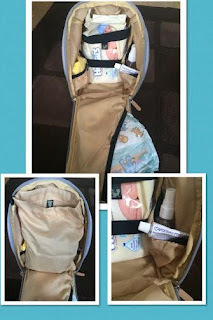 The food pouch is all wipe clean inside and insulated and the changing pod has 4 different compartments that are all labeled for easy storage an access of all the additional changing bits you need like cream and hand gel. I LOVE this bag and am so glad that we brought it (well to be fair it was a gift from my wonderful grandparents) and I honestly believe it is well worth the money!! I always wanted to try a pink lining bag as they were raved about when I was pregnant but I struggled to find a bag that would not bag Hubby feel silly carrying it. I live in hope that pink lining will one day start selling a bag less Mummy orientated and more for both mummy and daddy. 3 spoons as you never know when you will need a spoon! A bottle of ready made Cow and Gate Follow on 2 just in case we ever get caught out with out the water and milk powder that we normally use at home. Ella's kitchen smoothie and Ella's kitchen Chicken and rice casserole. These once again are emergency supplies just in case we ever got caught out somewhere and I didn't have Bubba's food with me or didn't have access to buy him anything..plus these are super scrummy!! Ella's kitchen Puffits. Same as above really but just as a little snack just in case. Some huggies sensitive wipes..only as I am out of Aldi ones and need to use these up otherwise it would be Aldi all the way! A tiny tube of Metanium which I think is a sample size but its perfect for keeping in my bag. A waterproof bag which at the moment has a change of clothes in with but what I love about this is that if Bubs has an accident and needs to be changed then the dirty clothes just pop straight into this bag to stop anything else getting dirty then all goes in the wash when we get home. 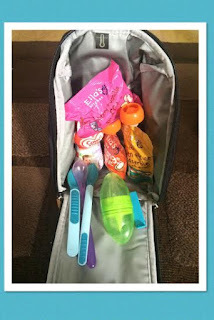 One part of this bag that I love is that you can remove the pods and attach them to your pram handles to them give you more room in the bag itself if you need it. Toys - a must have for me at the moment as Bubba is into everything! I tend to keep his Sophie in there to chew on, some other little teether, a couple of rattly noisy toys and his mickey as his little comforter if we are out. I try not to take his favorite toys out as I always worry about his throwing them out and loosing them. Bubbas red book - this may be a little too much but as I have said previously, I am a worrier and like to know I am prepared. I keep his book in the bag so that if anything every happened to me then someone could look in it and get Hubbys number or Bubba's details to help us. Shoes - I don't tend to put Bubba in his shoes all the time as I am conscious that I want his feet to grow naturally but he does like to be able to walk around (holding our hands) sometimes so I always keep this to hand so we can pop them on if he wants to go for a wander. Sun cream - no brainer really. factor 50+, baby and sensitive skin sun cream. Sun hat - once again...no brainer at the moment. Rain jacket - with the weather the way it is I always keep this little jacket in my bag. I picked it up at the Aldi Baby event and folds up tiny so I can keep it in the bag just in case! Dribble bibs - these are from Funky Giraffe as they are the only bibs we use anymore as they are so bloody brilliant!!!! Bubba is a super dribbley baby and with his teeth popping through at the moment too you can imagine why we have these to hand at all times! Dummies - Bubba only tends to have a dummy if hes tired now but I always keep a pair in here for emergencies. Calpol, calpofen, teething granules and bonjela - All pretty self explanatory really. I just keep a couple of sachets of each in the bag in case we need them as you never know when teething will attack!!! So thats everything! It seems like such a lot when I sit and write it all down but its really not when you think about what we use from it. I also don't expect his changing bag to stay like this very long as it always seems to be changing as he gets older. I said to Hubs the other day 'Can you remember when this pod used to be filled with bottles and milk and now its filled with snacks and juice?!'. Its crazy!! Your 10 months old today! I can't quite believe that it was 10 months to the day that you came into our lives and turned them upside down..all for the better of course! Your turning into such a funny, cheeky, happy little boy and everyone that meets you always remarks on how smiley and happy you are as whenever you see someone you give them your funny sucked in bottom lip grin. It makes you look soooo cheeky but I love it. Development wise you are coming on leaps and bounds and its actually a little scary to see just how quickly you are growing up. You seem to have suddenly turned into less of a baby and more of a little dude almost over night. Your now crawling and you are so so fast! To start with you couldn't really get the hang of it and you kept getting your leg stuck underneath you but now your going there is really no stopping you. If your playing in the lounge and I'm in the kitchen, I know your coming as I hear your little hands pit pattering across the floor. To be honest I am surprised that your crawling as I really thought you would walk first. In saying that, your still desperate to walk and your getting so good at it. You crawl over to the sofa (or anything you can pull yourself up with, even the wall) and pull yourself up and start side stepping like a little crab. You give me (and Nanny and Daddy and anyone who is watching) heart attacks though as you tend to try to let go and do 'no hands' whilst looking very proud of yourself :) You can also walk holding onto to just one of mine or daddy's hands now but your very wobbly. 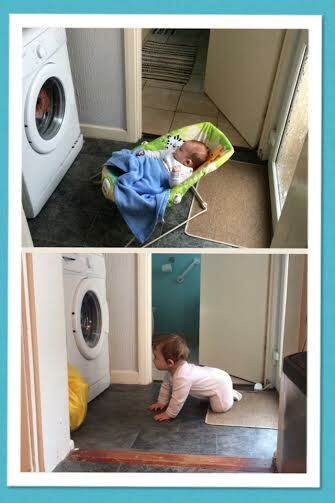 I don't think it will be long until your off toddling around on your own and then the fun will really start! Talking about fun, this whole crawling thing has brought with it a whole load of new fun things for me and Daddy to worry about. You love nothing more than trying to explore what is around you. You try to open every cupboard and draw it the kitchen and constantly pick up any little crumb or spec of dirt you find on the floor which is a good thing in a way as its giving me a great intensive to keep the house clean. Daddy fitted lots of draw locks and cupboard locks as well to stop you for getting any of the things that could hurt you out. I have to have eyes in the back of my head now as if I'm not keeping an eye on you then you are off making mischief :) We wouldn't have it any other way though. Your still eating really well and love feeding yourself now. You love cherry tomatoes, grapes, bread sticks and yogurts. I had you weighed about a week ago and you were 22 lbs 10 oz which is just where you should be so your doing so well. You've started to drink less and less milk now as I think you are starting to learn that there is more to your belly than milk and you love it!! 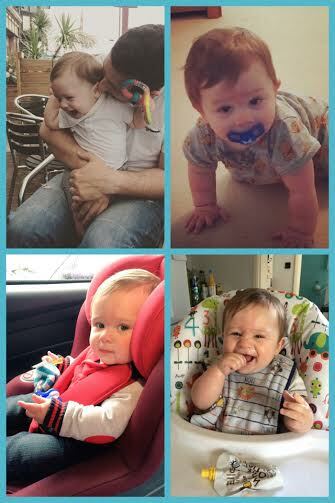 There are only 2 more months until your 1 years old and I can't quite get my head around that fact...1 years old!!!! That is madness to me. But before then we have lot's of fun things to look forward to like our first family trip away at the end of July, your first trip to the zoo coming up and I'm sure lot's of fun things that we don't even know about yet. Becoming a Bubble Barber with Paddy's Bathroom! A little while ago we were sent a brilliant box of goodies with the challenge of turning Bubba's bath time in a Bubble Barber time (explanation coming up don't worry) and it was a LOT of fun! Paddy's bathroom has recently launched a brand new range of certified organic and natural toiletries that are jam packed with good stuff so its super gentle on sensitive skin and sting free on little ones eyes! If the design and packaging look familiar then that's because Paddy is Ella's (from Ella's kitchen) brother and their Dad, Paul Lindley, created this bathroom range to help make bath times less stress and more fun. Now, before we get onto the fun of the bubble barber..lets talk about first impressions. The first thing that hit me before I had even opened the box was the amazing fruity smell coming from all the goodies inside. These products smell amazing! I love the Bubbly Stuff that smells like tangerines(I seriously want to eat it as it smells soooo good) and the Squirty Stuff that smells like mango's. They both have such yummy, fruity smells without smelling sickly and sweet like some products do. The next thing that I loved about these products is the packaging. From the font of the writing to the way that the bubble bath comes in a pouch, the entire range is very reminiscent of the Ella's kitchen range and I love that you can really link the two brands together. The Squirty stuff comes in a great bottle that has a lif on the bottom that you just pull out slightly then squeeze into your hand to get the most amazing bubbles and foam. Now...talking about bubbles...this is where the bubble barber comes in! When the Paddy's bathroom range launched they opened it's doors to the worlds first ever bubble barber for two days only. 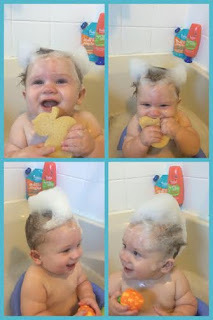 This was a chance for little ones to sport their favorite hairstyles in bubble form ranging from Elvis Presley's quiff to David Beckhams Mohawk. It was such a huge hit that Paddy's bathroom then decided to challenge people like me to come up with the best hairstyles we could made from bubbles. Getting the huge amount of bubbles needed was defiantly the easy bit as the products all create such a fantastic amount of bubbles...getting Bubba to sit still for 2 seconds for us to put bubbles on his head, well that was another matter!! We decided to use the Bubbly Stuff in the bath itself which created some wonderful, orangy smelling bubbles for us to make the actual 'hairstyle' out of and we also used some of the squirty stuff on his hair before hand as it has more of a mousse like consistency so we could slick all his hair down before the 'styling' commenced. Overall, we had great fun playing around at bath-time with Paddy's Bathroom and I was so glad that once we had finished and Bubba was all rinsed off and snug in his towel, we had no skin reactions which amazed me as Bubba does have quite sensitive skin. He was left squeaky clean and smelling wonderful. The whole range of Paddy's Bathroom goodies can be brought from Boots, Ocado and selected Tesco's stores with prices ranging from £4.49 - £5.99. Click here to visit the boot website to view the range. Note: These products were set to us for review by Paddy's Bathroom but all opinions are honest, true and my own. This is a question that I have asked hubby at least 4 times in the past week and before any of my friends or family start chirping up, yes I know I'm not "normal" :) but I'm asking am I a normal Mum? 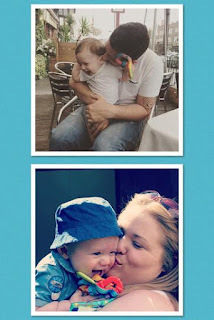 Recently there has been a lot of talk among my friends and in the blog and Twitter sphere about returning to work (if you haven't seen already, Al from the dads network's wife write a beautiful guest post over on his blog a few days ago..take a read here) and it got me thinking. The opinion that all of these lovely women shared was that they were devastated to be going back. One of my friends said how she burst into tears when she finally got to pick up her little cherub and another was saying how even the thought of going back to work soon filled her with dread and sadness. I wrote about how I felt about becoming a working mum but this was different. I just had this question running round and round my head... am I normal? I've been back at work now for almost 1 month now and before I went back I was fine. I wasn't worried about bubs, wasn't upset about leaving him and didn't shed a single tear! I am now left wondering why didn't I feel like everyone else did? Don't get me wrong, I knew that I would miss bubba and I do miss him when I'm at work but I focused on the positives. I was really looking forward to going to being Ami for a couple of days a week and having conversations with people that didn't involve poop or weaning. I was excited about the thought of being able to drink a hot cup of coffee and eat my lunch without little hands trying to steal it away. Writing it down in black and white, it almost sounds selfish saying these things because I love those little hands that steal my sandwich and I would give up a hot coffee for a bubba snuggle any day of the week. It may be selfish, I don't know. Suppose it's down to personal opinion. But now, after being back and settling into our new routine I honestly believe that I am a better Mum to bubba for going back I work (not saying that I am better than a stay at home mums or any other mum but I'm talking about me personally) as I appreciate the time I spend with Bubba so much more now and really do relish in every single moment we share. And I think, to answer my own question.. No, it may not be normal that I didn't get upset over going back to work but do you know what? That's what happened and that's how it goes. I think I had really just drummed it into my head that I was going back and that was that so there was no point crying over it as what was that going to do? So for now, I will just live with the fact that I don't feel normal for not getting upset and will continue to offer support to solo u lovely mummies out there that are feeling wobbly about going back to work :) you can do it and your Bubba will love you no less for it. At my Bubs house she has these little toy eggs with lids that squeak and come in a little egg box and Bubba loves them!! He is easily entertained with them for a good 15 mins which for him is pretty damn good. I came across a version of them on a website called Wicked Uncle and was offered the chance to review them and their service and I was super excited! Wicked Uncle (meant to be wicked as in cool rather than wicked as in witch!) has an aim to make it as easy as possible to find toys for boys and girls of all ages for birthdays, Christmas or just because :) They offer to gift wrap the toys, send them direct to the child with a handwritten birthday card and will even send you a reminder the next year to avoid any awkward moments. The part of the service that I really love and that really stands out to me is that if you end up buying to wrong thing or they already have that toy then you can return the product to Wicked Uncle and they will give you credit or replace it with something else. BRILLIANT! The website itself is so easy to navigate and all of the toys are split into age range so you can easily find suggestions for gifts and toys. The range of toys available is so extensive that they have a gift to suit every price range which I also love! Wicked Uncles aim is to basically become the best E-commerce toy shop on the net and they are ticking all the boxes for me! These are so great. I love the simplicity of them but they have already provided hours of entertainment to Bubs. He loves it when we build a tower and then he deconstructs it brick by brick. 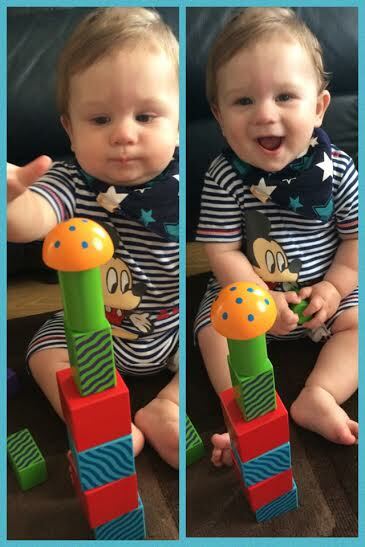 The blocks are sturdy whilst not being so heavy that Bubba can't pick them up and play with them. This took me back to my childhood! It is one of those toys that are timeless as it is so simple. This puzzle with different texture on the puzzle pieces is a little too old for Bubba right now so he's not too interested but as it's the kind of toy that won't age I am keeping it to one side for when he is old enough to play with it rather than just bash the puzzle pieces together! Delivery from Wicked Uncle was fantastic with the toys being delivered in a couple of days addressed to Bubba and coming with a wonderful little thank you post card with the original senders address on which would be lovely to send back from the child if these were birthday gifts. 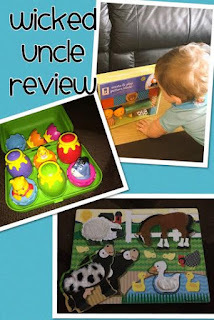 NOTE: WE WERE SENT THESE TOYS FOR REVIEW FROM WICKED UNCLE BUT ALL VIEW AND OPINIONS IN THIS POST ARE HONEST AND MY OWN. So a little while ago I was contacted by a company called OXO (no not the gravy people, although I will admit, this was my first thought too!) asking me to review their toddler cup from their OXO tots range. OXO was created in 1990 by Sam Farber, an entrepreneur in the homeware industry who wanted to create a range of comfortable kitchen tools that could be used by everyone. They then introduced the OXO tot range with the aim of making feeding little ones a little bit easier and a lot more fun and after using their sippy cup I would give them a high five as I think they have achieved this! This cup, in my opinion, is no normal sippy cup. One first looks, yes it looks like one. It has the soft, non slip handles that are curved to help little hands hold on to it. It has the traditional sippy cup lid with an additional leak proof valve which can be inserted and removed to give either a controlled or free flow and its dishwasher safe, BPA, PVC and Phthalate free which are all fantastic features but in my opinion, not unique or game changing. What is game changing though is the other features that also come with this cup. Firstly, you can remove the handles which leave you with a proper cup shaped cup (if that even makes sense!) with 2 little soft grip sections to help little hands hold on when learning how to hold a cup without handles. Secondly (and my most favorite thing about this cup) is the training cup lid which has a transparent insert in it with little holes all the way round the outside to let your child learn to drink out of a cup with out the risk that they will chuck the whole thing over their head or face! I love this feature as Bubs loves to drink out of grown up cups but doesn't understand that if he tips it too much the water goes all over his face and he ends up in a bit of a state after attempting to drown himself via cup! Due to the little holes around the insert it means that when they tip the cup there is enough liquid coming out to for the child to understand that they tip it to drink but not so much that they end up looking like that have been dunked in a bath! ANDDDD it gets even better...once you child has mastered the art of drinking from the cup with the insert in, you can remove it so you are left with a regular grown up cup. AMAZING! The only downside with this cup..and it pains me to say there is a downside as I honestly love the thought that has gone into this product..is that is doesn't cup with a lid whilst it is being used as a sippy cup. It is fine if you have the non spill valve in but Bubs doesn't drink it with that in and only drinks out of free flowing cups which means that this cup can't come out and about with us as it spills in the bag. Apart from the minor thing, this cup is brilliant. It adapts and changes as your baby grows and has features which to me, makes in stand out in a busy sippy cup market. 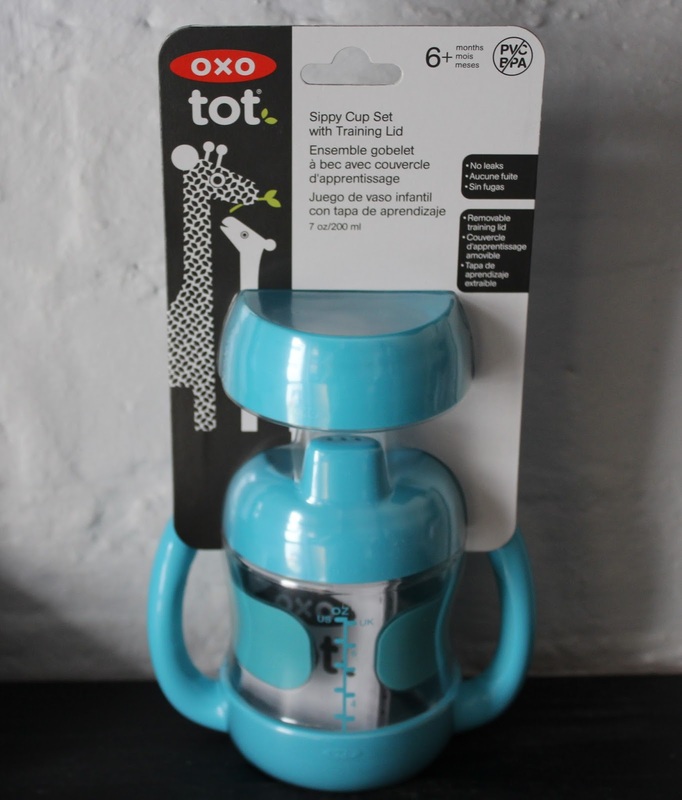 To purchase your own sippy cup (RRP of £10.20 which to me is a bloody bargain for a cup that will last this long) or to see the range of OXO tot goodies then click here!